Words you NEVER want to hear “you have cancer!” In that moment and time, your life changes, not only your life but your families too. Through a routine mammogram they found a small lump in my right breast. After that mammogram they wanted to do an ultrasound and then a biopsy. It was all so overwhelming. I couldn’t process everything they were telling me because all I kept thinking is I was going to die and not see my son grow up. Two reactions happen immediately, flight or fight! I choose to fight. There is so much you can read about breast cancer online, but I am going to tell you the things they don’t tell you! Because there are some extremely important steps to take in your early stages that will help you so much. Beginning the journey was my hardest part but with help from my sister and husband, we figured it out. First, research and find a breast surgeon that is part of a Cancer Institute or referred by one. My first biopsy was two hours and horribly painful because I had the radiologists at the hospital (that diagnosed my breast cancer). Bad decision! Once I found my breast surgeon, they did my lumpectomy, I learned they do many or several biopsies a day. Breast surgeons are experienced in the breast! Go to a breast surgeon to do ANYTHING on your breast. My second and third biopsy was less than 15 minutes and less painful by far. They are the specialties in their field so find a good breast surgeon to do your biopsies and surgeries. I learned on August 4, 2016 that I had Stage 1 breast cancer. Shari and I sat down and researched the Cancer Institutes and physicians that I wanted to see or needed: (this is your life so don’t base your decision on location, look for the best for your diagnosis). I interviewed several of them to find out where I best fit. Go do a consultation because it will help you understand how the office works, how the physician operates and how the patients’ needs are met. By August 10th I had all my physicians selected and confirmed. On August 12th I had my lumpectomy procedure, which is removing the mass from my right breast. Shari and I researched all the physicians and then Paul and I went and saw all of them and decided that we wanted to stay within one hospital group setting. Basically, all of my physicians above are within the Piedmont Health System. Although they may not know each other their computer software is all the same and all my surgeries, medicine, notes and anything about me is in their database. So whenever I see one doctor they can pull my medical records from the database and know exactly what I have done. Believe me – this is a life saver because I don’t have to carry my records with me to every single appointment. Buy a notebook and journal and write everything you feel and think. Keep track of your body reactions and healing. In addition, write down all questions you may have for your physicians. Breast Cancer affects everyone differently so make sure you track these concerns and talk with your physician about these concerns. 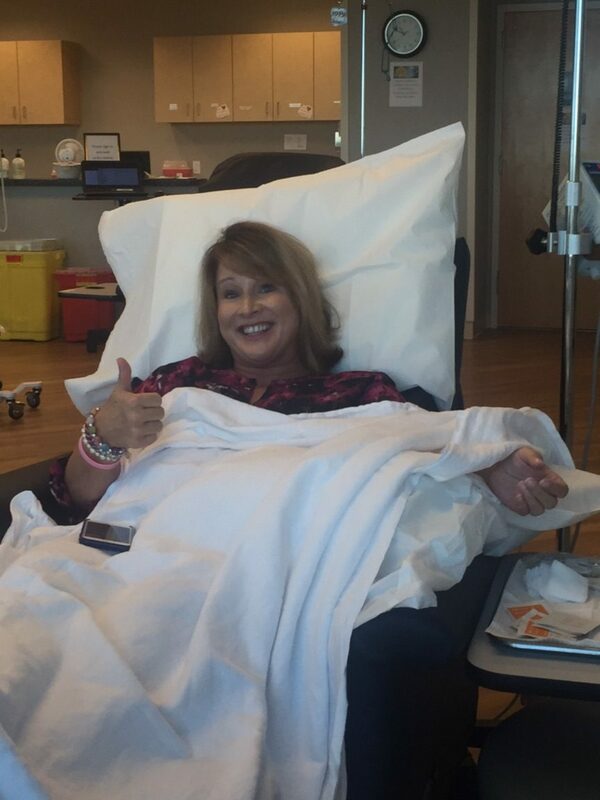 I had my first chemotherapy treatment on September 28th and it was so super scary! My husband went with me; he sat there for six hours as they measured the exact amount of medicine they were giving me. They give you just enough to kill you for the record. 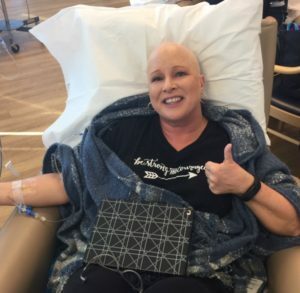 I stayed in the “chemo ward” and watched others get there treatments too. It was so humbling, these strong amazing men and women sitting working, reading, watching tv or just resting for hours and hours. Once I had my dosage amount, they started the IV and thus the medicine. First thing I noticed, my mouth instantly tasted like metal and became very dry. Second, I was very tired all of a sudden. But then it was just waiting. I had two types of medicine and I will explain more about that later. But my point of this first step is I loved my chemo ward and it was easy to operate through and the nursing staff was so helpful! So picking the right hospital system to stay with is very important!! I worked full time through all of my surgeries, chemo treatments and radiation. Work kept our lives normal which is what I wanted. I wanted to take my son to school every day (I did most days) and to work as much as possible. I didn’t want to feel sorry for myself, I wanted to be alive and live it. You do what is best for you! There is no right or wrong. Some people take short time disability and some take FMLA. Again, only you can decide what is best for you so think about it and do it for YOU! You will spend hours, days, weeks and years reassuring others that you are fine. I know this sounds crazy but it’s true. Funny, I am the sick one but reassuring others that I will make it or that I am fine. My theme song through this time was “Humble and Kind” by Tim McGraw because I always wanted to be humble and kind to everyone. Ask questions and then more questions – I kept my journal full of questions, because it helped me be proactive and more organized. I am a meeting planner by trade and having a plan always worked best for me. Each step of your process is different so track it and ask questions. I recommend getting the genetic testing done. I did it for all types of cancer (up to 55) and all mine came back negative (no mutation cells in my system). They categorized my cancer as “environmental.” I did the testing for my sisters, nephews and nieces. Keep in mind breast cancer happens in boys too. I wanted all my nieces and nephews to know if I had any mutation cells. I don’t want to fool you, this is a very hard decision but I felt it was important. You are the patient so you decide what works for you. I want to mention it because I believe it’s important. Stay positive! Always be positive. Most people will tell you stories of their friends and family that have died or horrible experiences with breast cancer or chemo or whatever. I always tried to stay positive; it helped me more than you know. Pray, one of my good friends gave me a pray book and I read it. I keep it beside me on my night stand and I read it still. Over and over, I prayed and I thank everyone who prayed for me. The power of pray is an amazing thing to witness. Just pray. I will explain in another blog post the side effects of chemotherapy treatment and how I managed through that. However, I wanted this blog post to be about breast cancer and how to better equip yourself with all that you are facing. You will get through this and be stronger once you are through it. Make sure you set up a good team of physicians to help you as the patient. Also, having family and friends to help you is a blessing….don’t say no when they ask to help, say yes. It makes your recovery process so much better! 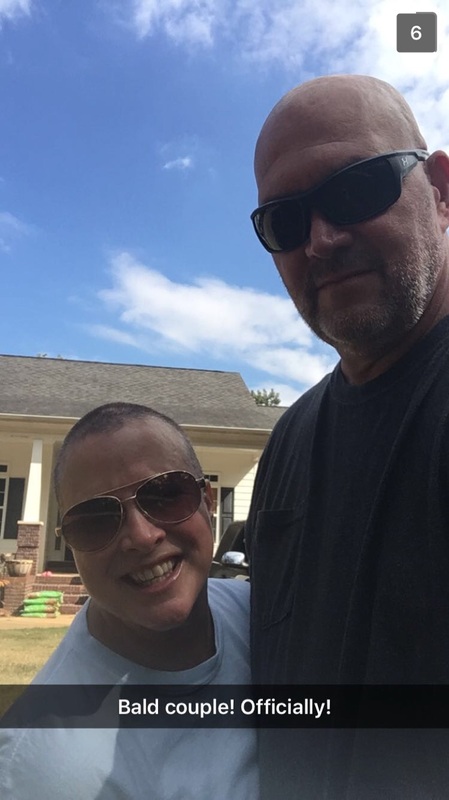 From a breast cancer survivor – I am here if you have any questions, send me an email! God Bless to all fighting cancer, stay strong and stay positive!